Today's Draw: The Knight of Vesicas from the Glastonbury Tarot. What do believe about money? Is it hard to get...in unlimited supply...the root of all evil? What do believe about yourself in regard to earning and spending money? Can you see how those beliefs are reflected back to you through your current money situation? 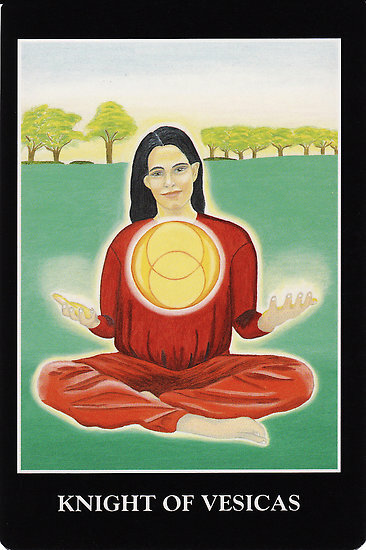 The Glastonbury Tarot is an out-of-print deck that I have been wanting for a while. It's one of those decks that was never at the top of my list to acquire, but always in the back of my mind. Then a couple of weeks ago someone posted a question about what decks are on your wish list and it occurred to me that my wish list was pretty complete. And then I remembered the Glastonbury. And I went to Amazon and found a seller selling one for a reasonable price and it was like kismet. Ever since I was a kid, I've always had a mindset that I never want for much. My parents were by no means rich, but there was never anything I wanted that I didn't get. Nothing I seriously wanted, at least. And throughout my life, I've always thought this a curious thing. Is it because I really don't want much? Is that why I've been so lucky as to get the things I want? Because one thing's for sure...if I had wanted a new car or a pony or anything truly expensive, it never would have happened. So that's always been my conundrum...do I always get what I want because I always get what I want (and we're talking material things here, not things like love or a 25" inch waistline)? Or do I always get what I want because I don't really want anything I can't afford to have? There's just something with me and material/monetary things that seems to work out. Like this past spring when Kizzie had to have an operation...the day after learning how much it would cost, a client called me for an "extra" job that had to be done very quickly and would be very time-consuming. The minute I wondered if I could afford it, life told me I could. Kismet. So why am I telling you this? Because I like to brag about how wonderful I am and how I'm dripping in jewels? Haha. No. Trust me, I live a simple life and I don't really ask for much, so I'm grateful that I get what I ask for. I'm telling you this because that's the what the Knight of Vesicas is all about. First of all, for those of you who don't know, vesica piscis is that almond shaped form that you see where the two circles intersect in the picture...the shape in the very center of the larger circle. It has mystical/astrological meaning and it's a form in sacred or universal geometry. In this deck, it hearkens to the design on Chalice Well, a holy well at the foot of Glastonbury Tor in England. In this deck, the Vesicas take the place of Pentacles, which is the sign of money and material things. And the Knight has conquered this energy. He is in control over it, rather than it having control over him. His command of this energy is so great that he doesn't even have to watch the energy as it rises. He just trusts that it will continue to rise. Many times we don't think of anything other than living creatures as having energy. But money *is* energy. First off, the money you have reflects the energy you put into your work. Your paycheck is a reflection of the energy of your work...the energy of your ambition...the energy of your prowess...the energy of your self confidence. The difference between people who earn a lot and people who don't is all about energy. Mind you, I'm not saying "effort". I'm saying energy. My competitors who make more money than me, do so because they have more drive, ambition, desire, confidence...their set point for what they want from life helps them generate different energy than me. Their desires will have them manifesting different opportunities and recognizing those opportunities when they come along. We attach ourselves to different set points based on what we want, yes, but more so what we believe about ourselves and our ability to create things in the universe. It's not about working harder or merely wanting more. It's about matching your energy to the energy of what you want. So what I'm saying here is that if you're in debt all the time, or just making enough to get by, that's based on energy. It's based on the energy of the beliefs you have about yourself and the way the world works. I've believed all my life that I always get what I want and I just don't want a whole lot. So that has been my reality. If I choose to believe tomorrow that I always get MORE than what I want, that will come to me, too. But I'll have to believe it. Which means I'll have to find and let go of whatever is limiting my energy from vibrating to the "more than I want" belief and overall vibe. My beliefs on this drive every money and career decision I make. The same is true for someone who earns millions, but files for bankruptcy. For Oprah, who will always have way more than she needs. For the modest earner that has a hefty 401K. And for wealthy peeps who live on a budget far beneath their earnings. It's all driven by our beliefs about money, about ourselves and about God, karma and/or our beliefs about manifestation, hard work, etc. Do you see this principle at work in your own life? Do you see how the same principles apply to more than just money?